Condition: Pretty good for age. It does have some foldwear, and damage to sides and ends, but it has been professionally secured. Despite condition issues it is a gorgeous piece. Notes: This is a beautiful Tekke rug, featuring the less common 'turreted gul' as opposed to the more frequently-seen 'Tekke' main gul. 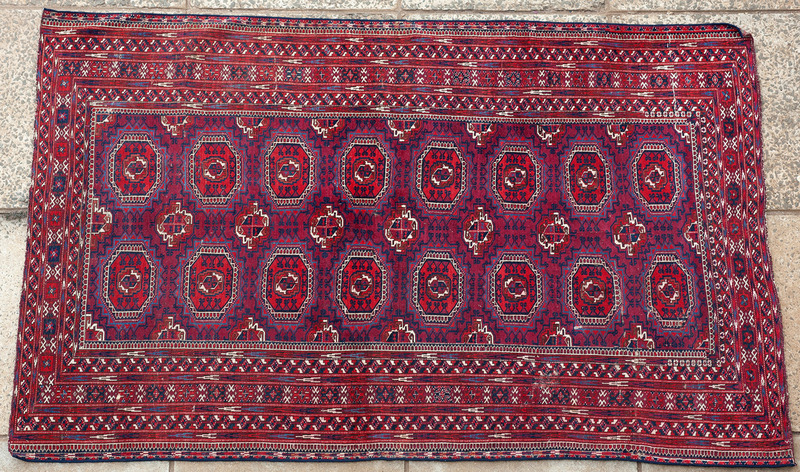 There is still some debate over where these rugs originate and some attibute them to the Saryk tribe (who had defeated the Salor, and were themselves then defeated by the Tekke), however it seems most likely that they are indeed Tekke - the purple/blueish red colouring, the busy and broad borders and the fine weave all suggest such. A stunning and collectible piece from the turn of the century.